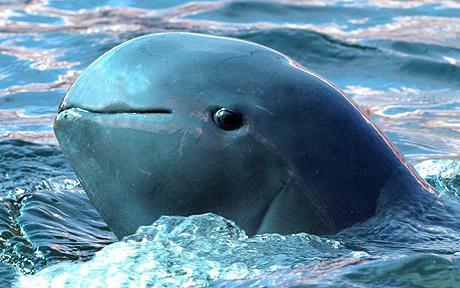 "Kratie is the best place in Cambodia to view the rare freshwater Irrawaddy Dolphins that inhabit the Mekong River. A pod of these small dolphins live in a stretch of the river that is around 15km north of Kratie near a village called Kampi. To get there, you can take a tuk tuk or motorbike taxi, or take yourself by rented scooter or bicycle to Kampi, where you can hire a boat and driver to take you out to see the dolphins. Viewing the dolphins costs about $9 per person for up to two people in the boat. If you have a larger group, the price drops to $7 per person. The motor boat will take you out into the middle of the river and then turn off the engine and paddle the boat with an oar so as not to disturb the dolphins. They stay out there for about an hour, so you will definitely see some dolphins." 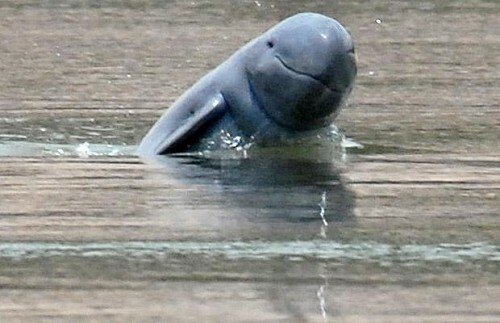 The stretch of the river around Kratie town is home to a group of rare sweet water Irrawaddy dolphins. Therefore the dolphins are the main tourist attraction of the province and the town. The river also has hundreds of green island, and circling water, which are also attracting some tourists. Kratie town is sleepy but picturesque with sandbars and big islands out front and bends in the river. There are some nice-looking homes of French and Khmer style scattered about, adding to the pleasant feel of the place. You'll also find a bustling market which is a great place to watch frogs being skinned (and escaping first through the holes in the nets), sample some delicious foods (such as freshly grilled corn cakes) and generally take in rural Cambodian life. 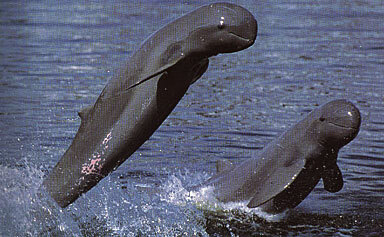 The rare freshwater Irrawaddy dolphins make their home in the Mekong River, just north of Kratie. 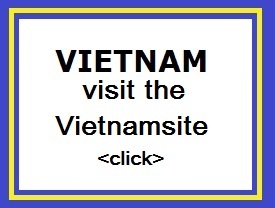 With only around 120 remaining, they are surely worth a visit. "We hired some bicycles in Kratie and did a 30km round trip to go and visit the rare Mekong Irrawaddy River Dolphins. The road to the site was peaceful, beautiful and full of wonderful people. As we cycled through the villages, every child would scream out hello and wave, some ran along with the bikes and others held their hands out to get a high 5. I've honestly never seen such warmth and friendliness from complete strangers. It was a great feeling to be greeted in such a way and it left a real impression on me. When we arrived at the landing point, we chartered a boat to get a closer look at the Dolphins. Their numbers over the years have drastically reduced, with the Khmer Rouge killing them and selling them to neighbouring countries, mainly for their oils. I believe this has made them somewhat sceptical about human interaction and who could blame them! We spent an hour in the boat and got some really good views, if not a little distant, just grateful to be able to see so many of the remaining 120 or so. We rode back to Kratie, passing the same smiling faces and witnessing a beautiful sunset over the Mekong."